Measuring in at a just 12 inches in length, the Hahn’s Dwarf Macaw is the tiniest macaw in the World! Hahn’s Macaws are also the smallest of the 3 sub-species of Red Shouldered Macaws, but they have all the attitude of their large macaw relatives. 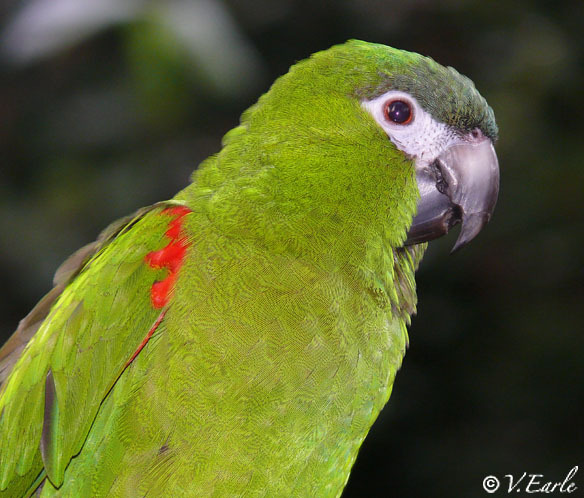 Hahn’s macaws are native to Venezuela and are primarily green with a blue crown and a dash of red on the shoulder. They live to be 30+ years of age. All macaws can be distinguished from other parrots by their relatively bare, light coloured face patch. This facial patch pattern is as unique as a fingerprint for telling individual macaws apart! Nelson has a big personality despite his small size. If you’re patient, he may play “Peek a Boo” and ask “Can I help you?” or “What’s your problem?” Listen carefully because he has a soft voice – you just might be lucky and catch his rendition of Madonna’s “Material Girl“! Nelson loves his toy bell and can sometimes be seen cuddling up to it for a nap. See an early morning video of Nelson waking up here. Exercise and play are essential activities for the physical and emotional health of all parrots. All macaws, big or small, love to chew and many will chew on anything within reach. Hahn’s Dwarf Macaws are intelligent and social and are generally considered to have easy going temperaments. They can, however, become destructive if not allowed to play and exercise. This is one reason why any parrot requires a great deal more commitment than owning a dog or a cat! • Contour feathers. These feathers are the outermost feathers that give birds their shape. • Flight feathers: These feathers are often the largest contour feathers and are located on the wings. They are divided into primary and secondary feathers, which together are called ‘remiges’. Primary feathers are the strongest flight feathers while secondary feathers provide lift when the bird soars or flaps. Shorter feathers called ‘coverts’ cover the bases of flight feathers. Tail feathers, called ‘retrices’, provide stability and control. • Down feathers. This type of feather is soft and fluffy and grows close to the skin to keep the bird warm and dry. They provide essential insulation and are located under contour feathers. Many bird species also select their mates by the brightness and colour patterns of feathers. The health of a bird is often reflected in its feathers and some studies have indicated that birds in good health are able to produce feathers with more vivid colouration. Nelson is small, but very green. So green in fact that he is often overlooked amidst the foliage! 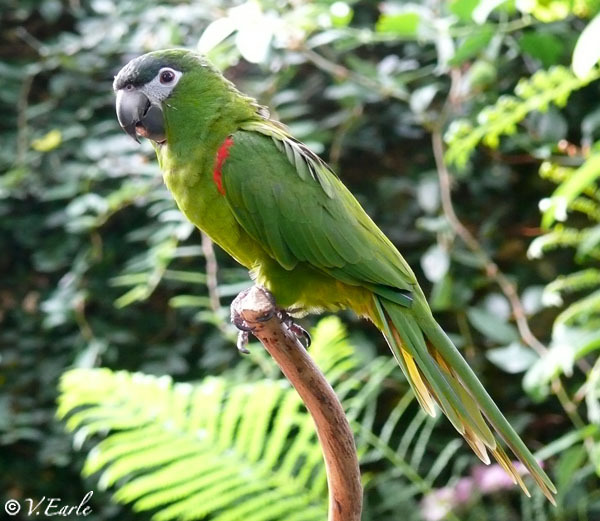 Why not stop in at Bloedel, find Nelson and pay him a visit? See if you can notice his different types of feathers. He would love to chat and play a game of ‘Peek a Boo’!